The air is turning cooler, football is on TV and the kiddos are back in school. While for some that may be a sigh of relief, we quickly realize that back to school doesn’t really free up much of our time. Soccer practices, homework, dance class, school parties and religious education begin to fill up what were once the carefree days of summer. So what’s a mom to do to be sure faith doesn’t drop to the last item of the day once homework and piano lessons are done? Grab time where you can and make use of any down time (yes, you do have some! ), like waiting in line at the grocery store, driving to and from various activities, sitting in the school pick-up line and hanging along the side of the field waiting for practice to finish. The good thing about daily devotionals is that they offer bite-size doses of faith that fit just perfectly in those spare moments. 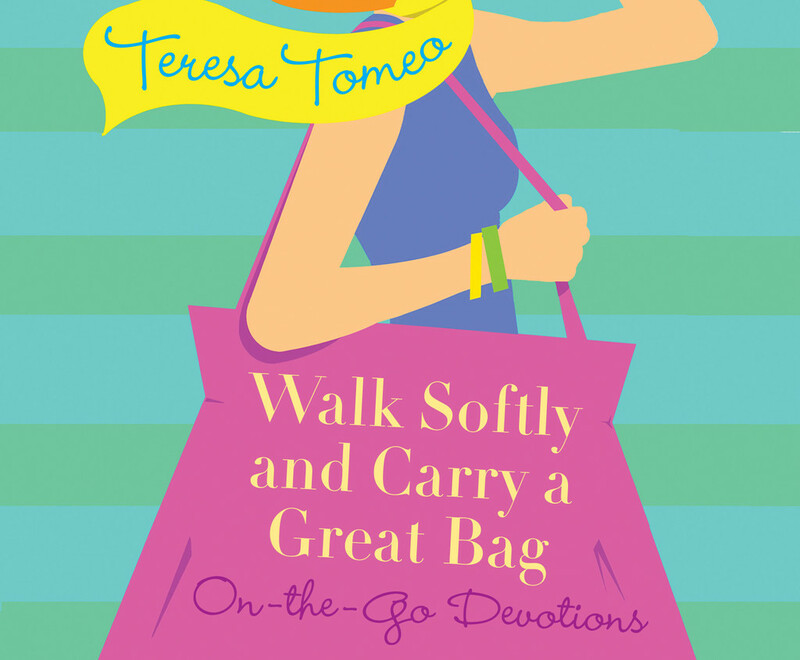 Walk Softly & Carry a Great Bag is a new devotional from Teresa Tomeo, feisty host of Catholic Connection weekdays on national Catholic radio, that fits the bill perfectly. With lots of wit and plenty of laugh-out-loud moments, it not only inspires but entertains. Another great one is Jesus Calling by Sarah Young, which is written as though Jesus is speaking to you and is incredibly comforting and compelling. Our Lady has made it clear in her many apparitions that praying the rosary is so important! Fit it in whenever and where ever you can and use your fingers if you have to. Can you pray a decade in the shower, another two taking the dog for a walk, one while folding laundry and a final one as you drift off to sleep? Just try to remember to focus on Jesus’ life and not what you’re going to cook for dinner that night. However you get it in, I’m sure Our Lady will be pleased! Think about how much time you spend driving in your car. You can listen to books about faith, EWTN Catholic radio, talks from Catholic speakers or even pray the rosary along with a CD. The Mary Foundation has a wonderful Divine Mercy & Rosary CD (ideal if you can’t remember the mysteries yet), along with some popular Catholic talks — all for just $1 each! Lighthouse Catholic Media has an MP3 of the Month program for just $3/month or sign up for Audible (owned by Amazon) to get a Catholic audiobook to listen to each month. If you have a high-tech car, you can even stream these items from your smartphone to your car’s sound system. Can’t remember to finish praying the novena you started? Sign up for the free Pray More Novenas email. Want to read the daily readings each morning? Sign up for USCCB’s daily email. Would you love to read through all four Gospels? Sign up to read a short blurb from each one over the course of a year from FlockNote. You can read all of these emails on your phone, again, while waiting for deli meat at the grocery, for the water to boil with your spaghetti or while eating your bowl of cereal in the morning. Most people do this at night before bed, but if you’re anything like me you’re lucky to stay awake long enough for your head to hit the pillow. So you might try fitting it in a little earlier. Matthew Kelly has a simple Prayer Process where he suggests the following: 1) Thank God for something in your day 2) Think about when you were and weren’t the best version of yourself in the last 24 hours 3) Consider at what points in your day God may have been trying to speak to you 4) Ask God’s forgiveness for anything wrong you’ve done 5) Speak with God about how He is inviting you to change your life 6) Pray for anyone you feel called to pray for 7) Finish with the Our Father.